The small island off the coast of Belize is exactly what we needed. Colorful. Laidback. Easy. We couldn’t have picked a better spot to coast into our journey. 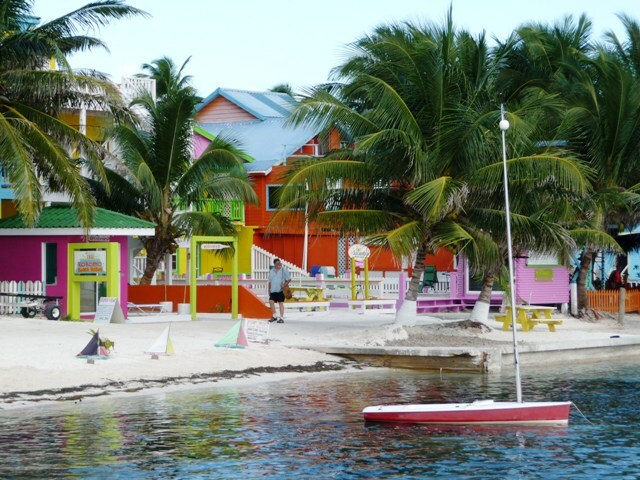 Caye Caulker, in its present form, exists to serve travelers and we are glad for it. The island is touristy but in a subdued kind of way. The dirt roads (and they’re all dirt roads) are lined with restaurants, bars, guest houses and dive shops. As a traveler, it has most everything you want, and none of what you don’t. Noticeably absent are the litany of t-shirt shops and boardwalk stores hawking junk that normally crowd out all sense of character in many tourist destinations. Caye Caulker has grown from its origins as a fishing village into something else entirely, but has done so in a way that preserved its island charm and avoided most of the pitfalls that sometimes consume other popular destinations. And yet the traveler-friendly nature of Caye Caulker comes at a cost. I get the impression that if the tourist boat didn’t arrive, most of the island’s inhabitants would simply go away. There really is no other reason for this place to exist. Tourism is the only sign of life on the island. The very best travel cities have their own center of gravity. They exist to serve a local population who are there to live lives, not explore sites. Sure, we visit them to see unique places, but we also go to experience different cultures. We want to see how locals live. We want to eat the food they eat, hear their music, observe their customs and learn of their history. When the center of gravity shifts too much in favor of the traveler, that local culture is supplanted by a generic one. Something important is lost. Caye Caulker suffers that fate, but it would be wrong to overstate the damage. We found a wonderful island with its own charm and some of the most brilliantly blue water imaginable. It is the perfect place for us to ease into Belize, even if we don’t feel like we really experienced the country yet.